Install Google Chrome Using Octopi. Manjaro is one of the best Linux distributions to pop up in the past few years. It provides access for many people to the Arch repositories which would ordinarily have been out of reach because Arch Linux is not a beginner level distribution. Manjaro provides a simple graphical tool for installing software called Octopi and it is very similar in nature to the Synaptic package manager and YUM Extender. In this guide, we are going to highlight the features of Octopi so that you can get the most out of it. The info tab displays the webpage URL for the package, the version, the license and any dependencies that the program has. You will also find the program's size and the size of the download required to install the package. Finally, you will also see the name of the person who created the package, when the package was created and the architecture it is created for. The Files tab lists the files that will be installed. The Transaction tab shows the packages that will be installed or removes when you click the tick symbol on the toolbar. The Output tab shows information whilst the packages are being installed. The News tab can be used to display the latest news from Manjaro. You have to press CTRL and G to download the latest news. The Usage tab shows you how to use Octopi. By default, you are limited to the repositories in Manjaro. You can find a package either by entering a keyword or package name in the search bar or by clicking through the categories and browsing for applications to install. You will notice that some packages appear to be unavailable. For instance, try searching for Google Chrome. A number of links for Chromium will appear but Chrome will not be displayed. Next to the search box you will see a little alien icon. If you hover over the icon it says "use yaourt tool". The yaourt tool is the command line option for installing certain packages when using the command line. It also provides access to install applications such as Chrome. Click the little alien icon and search for Chrome again. It will now appear. To install a package using Octopi right-click the item in the left panel and choose install. This won't instantly install the software but add it to a virtual basket. If you click the transactions tab you will see the to be installed list now shows the package you have chosen. To actually install the software click the tick symbol on the toolbar. If you have changed your mind and want to revert all the selections you have made thus far you can click cancel icon on the toolbar (denoted by a curly arrow). You can remove individual items by navigating to the transaction tab, finding the piece of software that is currently selected to be installed. Right-click the package and choose Remove Item. If you haven't updated the package database in a while, it is a good idea to click synchronize on the toolbar. It is the first icon on the toolbar and is denoted by two arrows. If you don't want to install new software but you want to see what is already installed, click the view menu and choose Installed. The list of items will now only show the packages installed on your system. If you just want Octopi to show the packages not already installed choose Non Installed from the view menu. The list of items will now only show packages that you haven't yet installed. 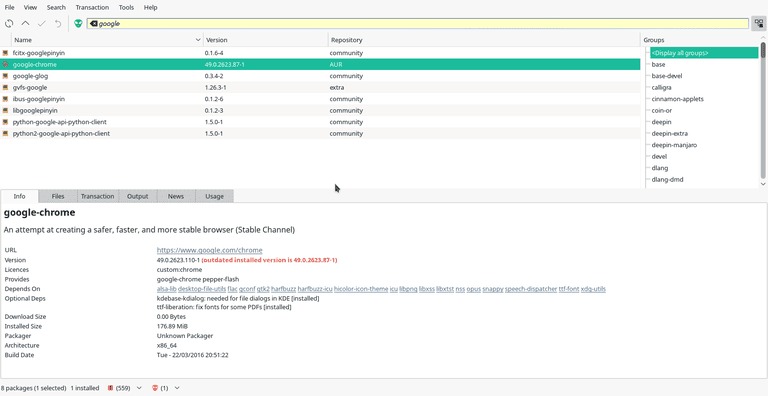 By default, Octopi will show the packages from all the repositories. If you want to display the packages from a particular repository click the view menu and choose Repository and then the name of the repository you want to use.